Yeah, this smile. 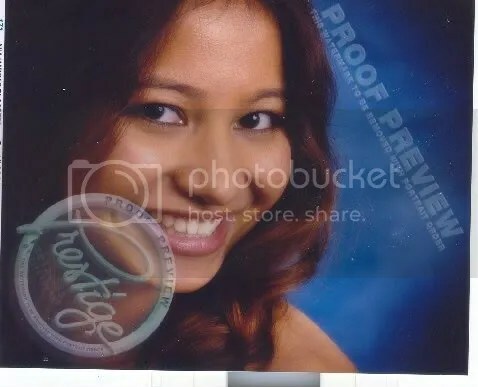 It won me the best smile in high school and cover picture of a schedule handbook at my university . Okay, it’s just a schedule of classes, but it’s every student’s Bible during enrollment period. I feel Hollywoodish when I get recognized. Ah, I can see my hair’s still that bottled light brown. I like light brown…..it softens my features. Keeping my hair artificially colored can be annoying, though. In about 3 weeks, the black tips show up, so I need to color it up again. I got so sick and tired of the routine I just let my natural black hair grow again. But on the 15th, my friend’s gonna put some red streaks on it. Oh, and I now have bangs.. not thick bangs though. … just thin and light. ah, this photo, the first photo you sent me. beautiful, hehe~but you’re lucky to be able to get into your school’s magazine, I never got the chance. oh, well.. I did, but only once, and.. not so good photo. ^^"
I made it 2 years in a row, but I only had this one copy . My father gave the other one to my aunt. I don’t have a good scanner. The quality of the copies that come out are terrible. Look at all the pics that I posed here. The bad pics are the ones that have been scanned. Used to be a good scanner, but it fell off the table, so maybe it jarred some of the stuff inside , I dunno.